Discussion in 'New Members Say Hello' started by Fourstarrs, Oct 9, 2011. 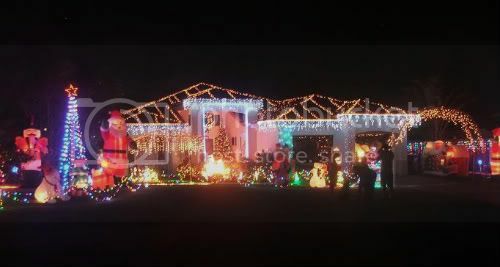 Hi, Just stumbled on this forum last night whilst searching for new things after deciding that we were going to start doing a light display again this year. Along with the family, I have been decorating our homes for the past seventeen years and have added a little to our display each year. 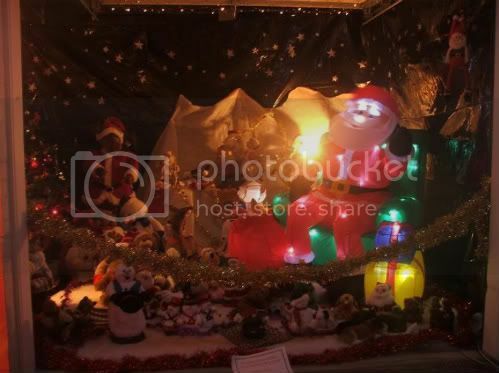 We skipped last year after being sick and tired off vandalism and having to sit up every night for four weeks from the previous year trying to fend of teenage groups that were attempting to destroy the display. Along with quite a few others on the Sunshine Coast, we had retired from the Christmas light scene but after having the last year off we've decided that we're not going to let a dozen or so local little $#%&@ stop us again from doing something that gives a lot of joy to so many people in our community. The last display that we had prepared was a reasonable size and had just under 40,000 bud lights, 250 metres of rope light, 18 large inflatable decorations, a double garage display with numerous motionettes and other Christmas toys, a nine metre double arch over the driveway (which was the most targeted item by the local yahoos) and numerous Gemmy light and sound path stakes and so on. I desperately wanted to make the display automated but just couldn't find anyone two years ago to steer me in the right direction. I would be very keen to catch up with any of the Brisbane based members that wouldn't mind sharing a few tips on automating a display. you have come to the right place for controlling your display, there are many people here, maybe around the corner from you, that now control there display via the computer. You should pop into the Chat room sometime, there's normaly plenty of people there to say hi an help you with any idea's you might have. I will jump on to the chat room soon but am blown away by the info on the Forum. I am having a field day reading through several posts on how to, what to, where to and so on which will chew up much of my spare time for now. I was supposed to be putting the final touches on my company website over the weekend but have been sidetracked after stumbling upon ACL. I was just about to purchase 50,000 LED lights from China but I will hold off now until I have done some homework and taken some advice from ACL members first. Chat soon! Five star display you have. Welcome to ACL. Our christmas lighting community is getting bigger every year. We do have one major meet and greet in Qld around June, July and these are great opportunities to catch up with fellow members. So keep an eye out for that one after Christmas. Welcome to ACL, we are glad that you have found the forums as the more involved the better. Your display looks fantastic and would look great with the next step of having a computer control. As far as doing something this year, you may be pushing it as there is a lot of work that goes into putting on a computer controlled display, many of our members have made this a 12 month hobby. But there is nothing stopping you from dipping your toes in as its the first time that is always hard as there is a learning curve to understand all that goes into having a successful show. Anyway feel free to ask questions, pop into chat, the guys here are always happy to help even though most of us are head deep in preparation for this season at the moment. jeromej Newbee, and learning the hard way!!! Excellent display, you must be very proud of it. this lovely display of the Christmas spirit. This is my first year doing an display and you will find all the help you need for the member here, just don't be scared to ask. Yep. That's a real nice display and it's a real shame that vandals do anything to such a great looking display. As Eddy said floods and cameras should deter the little #$@#&s. Motion activated floods that run when your lights aren't on should keep them on their toes. Just remember try not to blind motorists and try not to detect any cars heading along your street. A nice 24hr security monitoring sign should also give them something to ponder.